Allow AnyVan to make your move to France as easy and cost-effective as possible! Our international removals services will handle all of your logistical needs, whether you are relocating to a new house or moving your business to a new office. Get a French removal quote today and let us take the stress out of your move! You can rest easy knowing that our trusted transport partners will take the utmost care with your belongings, whether you are transporting furniture, cars or even your household pets. We assign expert European move coordinators to oversee our international moving operations from start to finish. Throughout your move, you will always have a point of contact ready to provide updates as your belongings get from A to B. Whatever your trip might involve, whatever the destination, we are ready to offer expert service at a fantastic price. Moving to and from France, whether for work or for personal reasons, will give you a LOT more to consider than a standard move in the UK. This is especially true for self moves, as the cost of hiring, insuring and fuelling your own moving vehicle can quickly escalate out of control (to say nothing of having to deal with changing road laws). If you fail to give yourself enough planning time, you could quickly start to panic, but AnyVan is here to take the stress out of your move. Not only do we provide top-tier services for international removals, but we can also offer excellent prices. 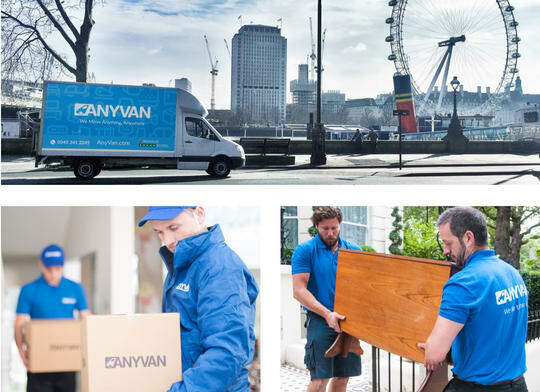 Even if you are moving at a moment’s notice, AnyVan will be ready to leap into action, ensuring that your entire international move is in safe hands. France has the advantage of being an incredibly diverse destination for British expats. It may just be a short skip across the channel, but moving to France can easily become an incredible adventure. Whether you are looking for beautiful countryside, gorgeous beaches or bustling cities, France definitely has something to offer you! There is no denying the glorious culture and sightseeing opportunities of areas like Paris, Lyon and Bordeaux, though there are also plenty of job opportunities here for when you stop feeling like a tourist. Expats can also enjoy incredible health services and transport links, though French-speakers will naturally have an easier time adjusting. For those looking for sunshine and welcoming communities, areas like Brittany, Marseilles and Nice are absolutely perfect. Not only can movers find plenty of English-speaking friends (and schools) here, but they can also find a wealth of employment opportunities, both in tourism and beyond. AnyVan’s international removal services span the entire European continent. If you’re looking for great prices moving to or from any location in France, don’t hesitate to get in touch! We’ve already helped thousands of happy movers, and we’d love to do the same for you! Our experienced European transport partners are ready to help with disassembling, transporting, storing and reassembling your belongings, whether you are shifting a sofa or a grand piano! We can even accommodate vehicles and pets, ensuring that you can start your new life in France with no trouble whatsoever. Request a free quote today to find out your removal costs to France.